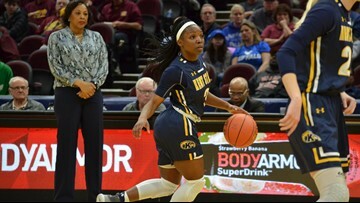 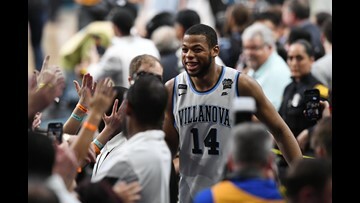 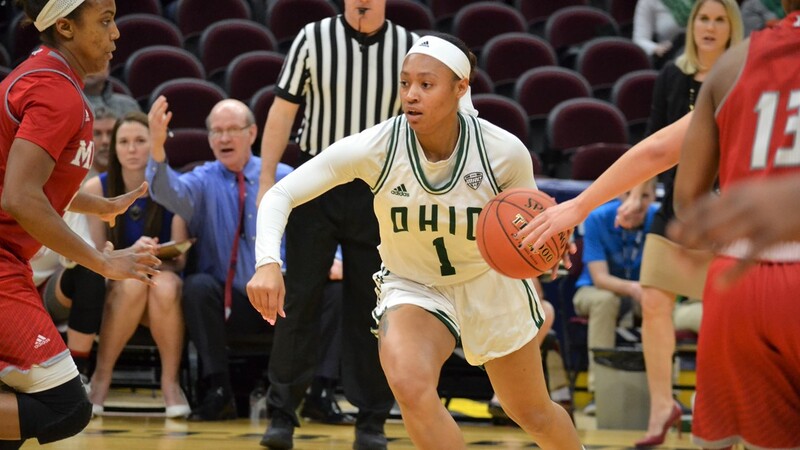 Ohio University junior guard Amani Burke looks for a passing lane against the Miami (Ohio) RedHawks during the first half of play in their 2019 Mid-American Conference Tournament semifinal matchup at Quicken Loans Arena in Cleveland Friday, March 15, 2019. 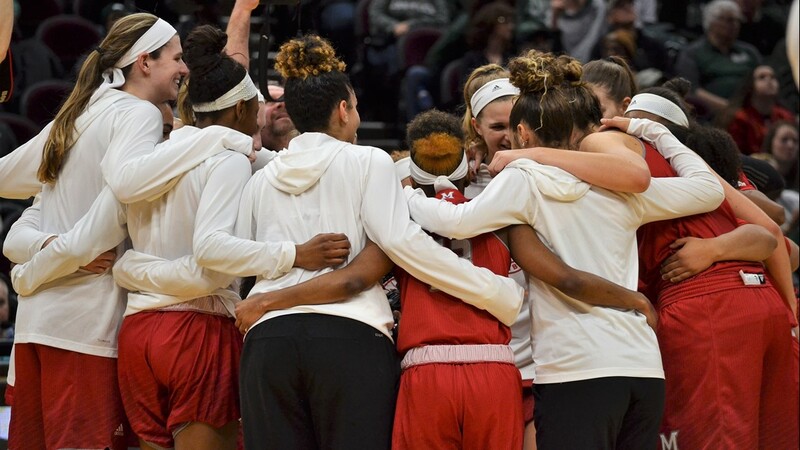 The Miami (Ohio) RedHawks huddle up before the opening tipoff of their semifinal matchup against Ohio University in the 2019 Mid-American Conference Women's Basketball Tournament at Quicken Loans Arena in Cleveland on Friday, March 15, 2019. Ohio University junior guard Amani Burke drives to the basket against the Miami (Ohio) RedHawks during the first half of play in their 2019 Mid-American Conference Tournament semifinal matchup at Quicken Loans Arena in Cleveland Friday, March 15, 2019. 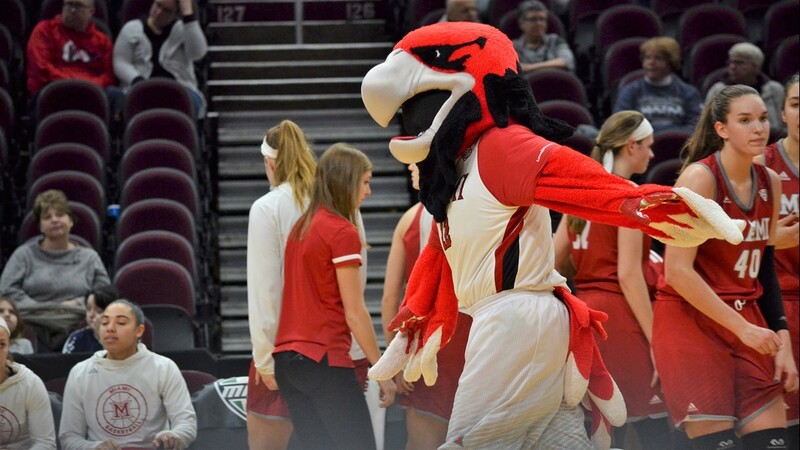 Swoop the RedHawk flies off the court during the first half of play in their 2019 Mid-American Conference Tournament semifinal matchup against Ohio University at Quicken Loans Arena in Cleveland Friday, March 15, 2019. 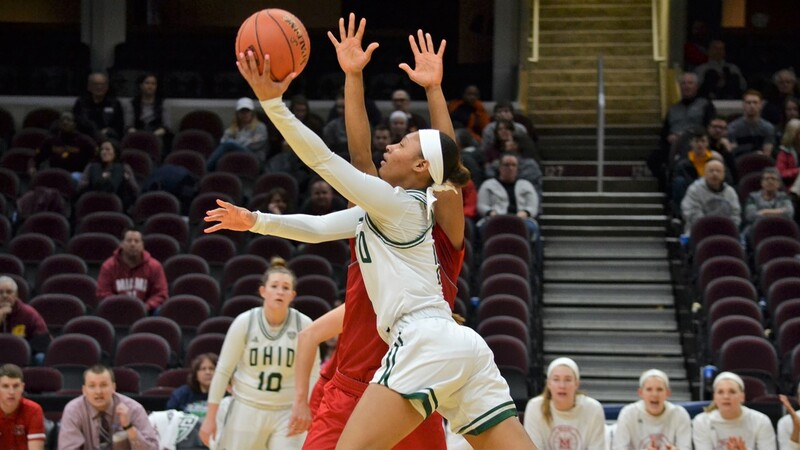 Ohio University sophomore guard Cece Hooks goes up for a layup against the Miami (Ohio) RedHawks during the first half of play in their 2019 Mid-American Conference Tournament semifinal matchup at Quicken Loans Arena in Cleveland Friday, March 15, 2019. 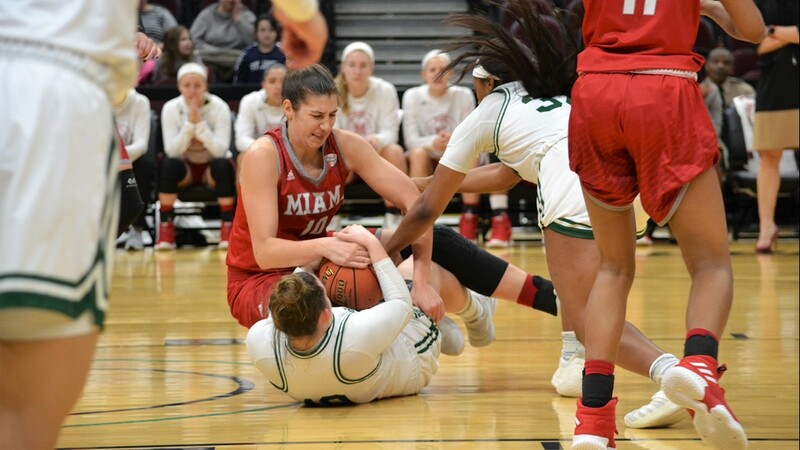 Members of the Ohio University and Miami teams compete for a loose ball during the first half of play in their 2019 Mid-American Conference Tournament semifinal matchup at Quicken Loans Arena in Cleveland Friday, March 15, 2019. 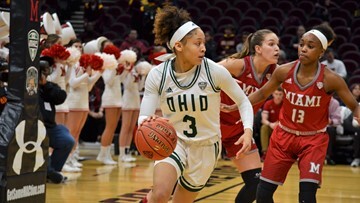 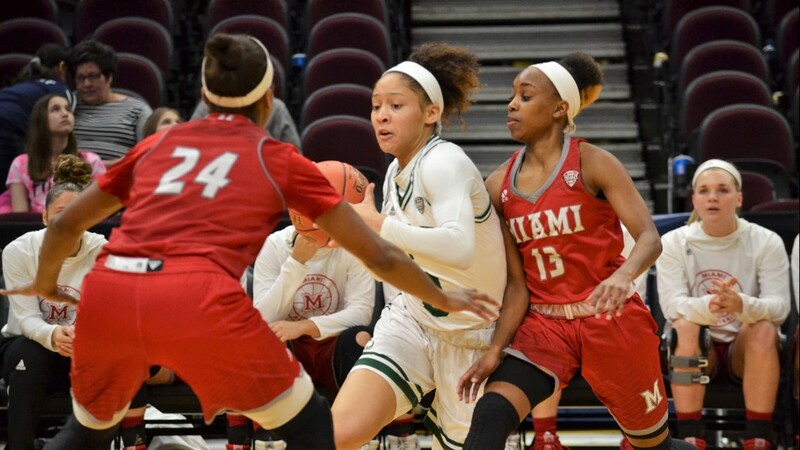 Ohio University sophomore guard Cece Hooks drives to the hoop against the Miami (Ohio) RedHawks during the first half of play in their 2019 Mid-American Conference Tournament semifinal matchup at Quicken Loans Arena in Cleveland Friday, March 15, 2019. 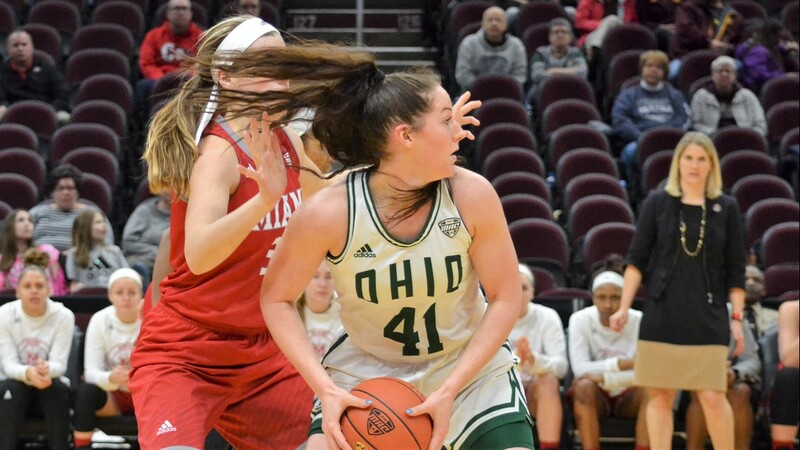 Ohio University forward Gabby Burris posts up against a Miami (Ohio) RedHawks defender during the first half of play in their 2019 Mid-American Conference Tournament semifinal matchup at Quicken Loans Arena in Cleveland Friday, March 15, 2019. 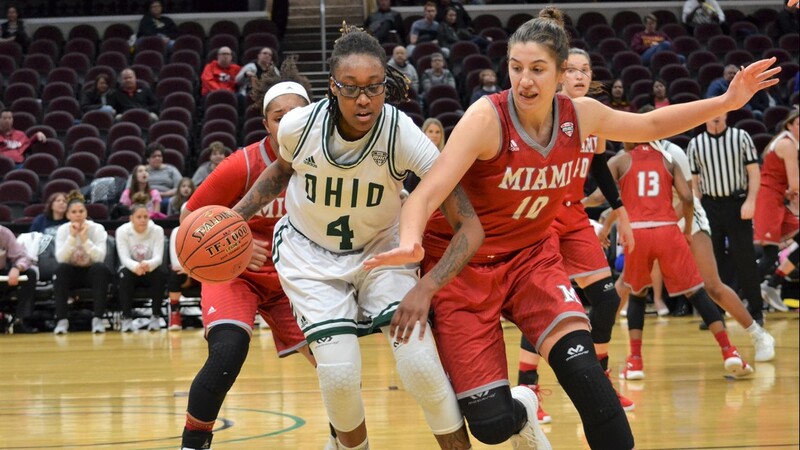 Ohio University forward Erica Johnson protects the ball against Miami (Ohio) RedHawks senior forward Kristen Levering during the first half of play in their 2019 Mid-American Conference Tournament semifinal matchup at Quicken Loans Arena in Cleveland Friday, March 15, 2019. 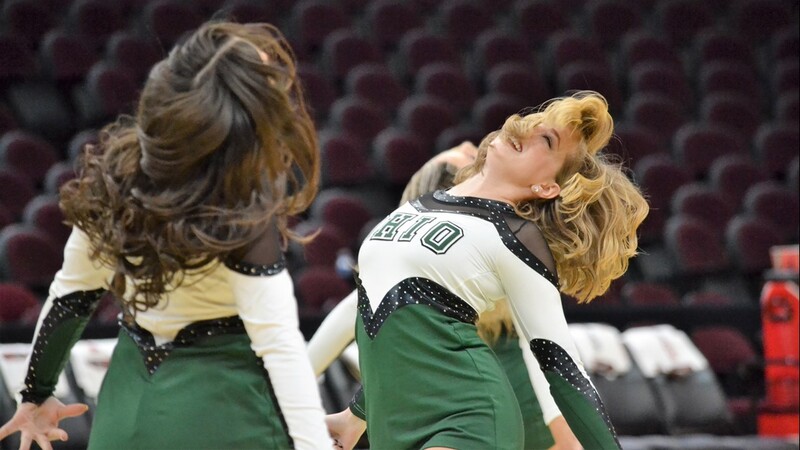 Members of the Ohio University dance team entertain the crowd at halftime of their 2019 Mid-American Conference Tournament semifinal matchup against the Miami (Ohio) RedHawks at Quicken Loans Arena in Cleveland Friday, March 15, 2019. 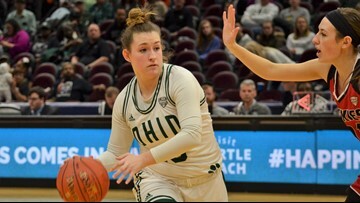 A member of the Ohio University dance team entertains the crowd at halftime of their 2019 Mid-American Conference Tournament semifinal matchup against the Miami (Ohio) RedHawks at Quicken Loans Arena in Cleveland Friday, March 15, 2019. 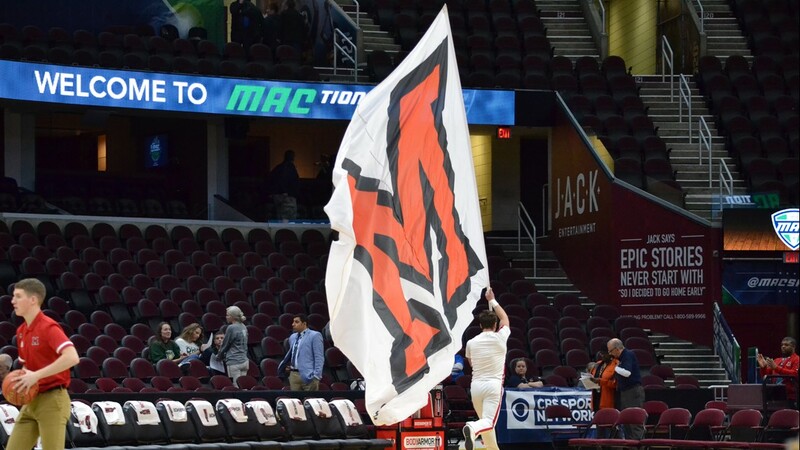 A Miami (Ohio) RedHawks cheerleader leads the team onto the court for the first half of play in their 2019 Mid-American Conference Tournament semifinal matchup with Ohio University at Quicken Loans Arena in Cleveland Friday, March 15, 2019. 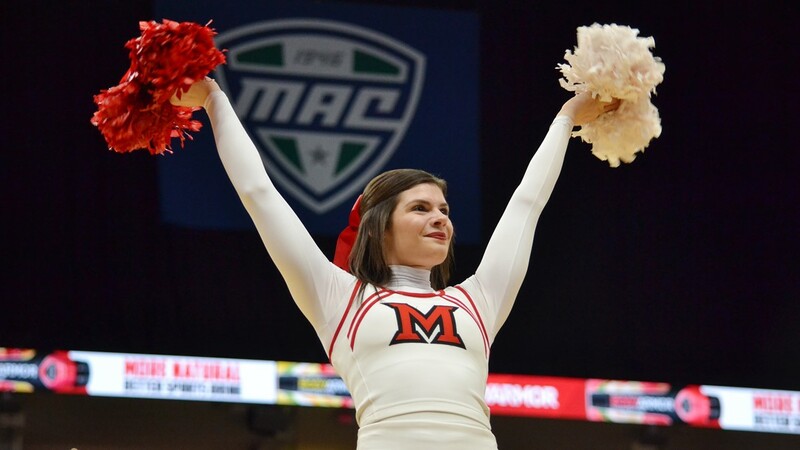 A Miami (Ohio) RedHawks cheerleader revs up the crowd during the first half of play in the 2019 Mid-American Conference Tournament semifinal matchup with Ohio University at Quicken Loans Arena in Cleveland Friday, March 15, 2019. 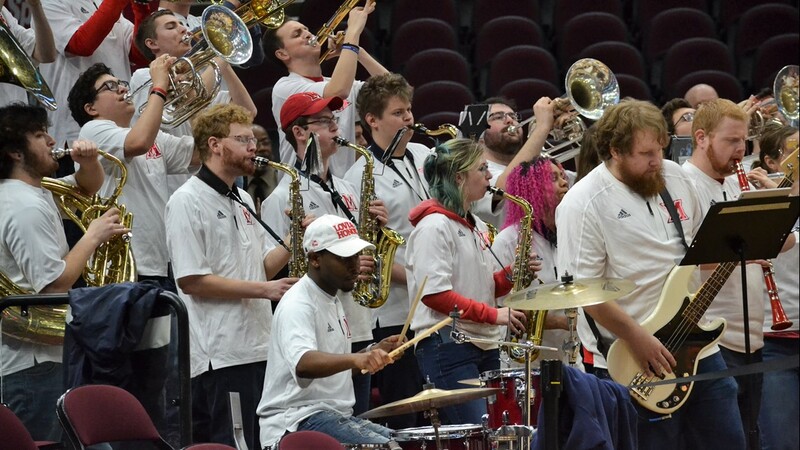 The Miami (Ohio) RedHawks pep band plays during a break in the first half of their 2019 Mid-American Conference Tournament semifinal matchup against Ohio University at Quicken Loans Arena in Cleveland Friday, March 15, 2019.